Point Reyes is a National Seashore treasure full of incredible wildlife and breathtaking views. But sadly, much of this amazing habitat may be wiped out by likely changes by the National Park Service that would allow farm land to take over…BUT you can help stop that until November 15th. In our National Seashores post, we made an interactive map of the treasures by the sea that are protected, natural lands. What’s so amazing about these places is that the scenery and wildlife are allowed to flourish and thrive without human development interfering. They are truly precious! 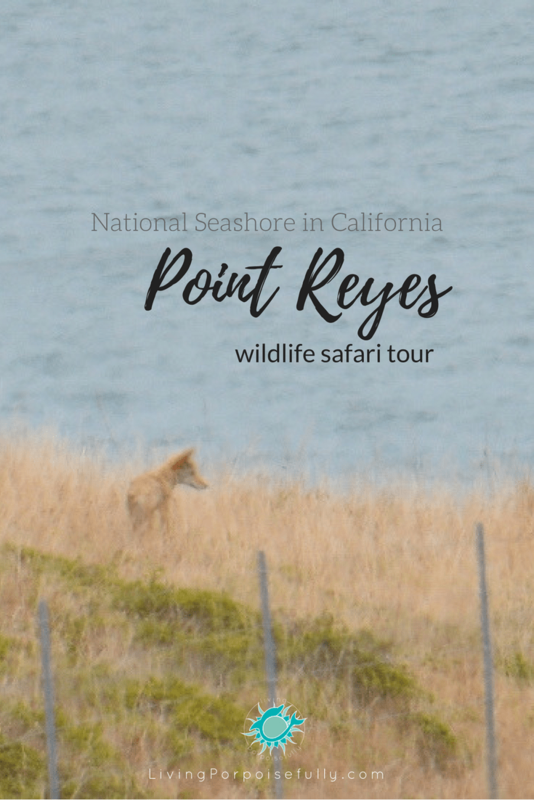 So on our trip out to California, we decided to check out National Seashore Point Reyes with the help of a local naturalist, Daniel Dietrich of Point Reyes Safaris. What better way than to go with someone who knows the ins-and-outs of the landscapes and the creatures in it!? What we experienced was a wildlife photography show like you might see on BBC, with elephant seal contests, tule elks colliding antlers, along with glimpses of the elusive bobcat, an owl family, and a fox, among countless others! Welcoming us into the park was a coyote eying us watchfully…making for quite possibly our favorite photo of the trip! Arriving at Elephant Seal Overlook, we witnessed several males engaging in heated bouts of physical dominance. You could feel the tension in the air! While the females soaked in the sun, males were in each other’s faces, having standoffs over who’s boss and taking some good licks at their opponent with their teeth. Many of them battled it out in the water, continuing on shore too. We can imagine that the real deal of breeding season (December – March) would be even that much more dramatic than when we went in June, but there was still plenty of action! What’s incredible is that these animals weren’t seen in Point Reyes for 150 years but have now grown into a colony since they returned in the 1970’s. The crash of the antlers, the worn-out huffs of exhaustion, and their strained bugling (high-pitched calling) filled the silence, not accompanied by the music you might expect from a documentary! We couldn’t believe the incredible wildlife that Point Reyes had to discover! We especially loved being able to learn more about the habitat and animals from our highly skilled guide, who is clearly passionate about what he does! We would have missed so many sights, not known what to look for, and not have experienced such a thrilling adventure without his expertise. We fell in love with the natural beauty and wildlife treasures of Point Reyes, and were saddened to find out this incredible haven may possibly disappear in the very real near future. Increased farm land is threatening to take over, completely changing the habitat and rendering it uninhabitable for many of these creatures, including so many of the ones that we saw: bobcats, badgers, owls, herons, egrets, and tule elk, among hundreds of other animals. What’s even more, is that this potential change would render these lands to have no public access for nature-goers like you and me. The lands would be converted to either row crops or sheep and chicken farms — either of which would result in the downfall (and even slaughtering!) of creatures like tule elk, bobcats, and coyotes, along with the habitat loss of countless others. In 1962 Point Reyes National Seashore was created to “save and preserve for purposes of public recreation, benefit and inspiration, a portion of the diminishing seashore of the United States that remains undeveloped“. Let’s keep it that way, shall we? The public comment period is open for a very short time. If you agree, please join us in taking the opportunity now to comment, stating your objection to the allowance of row crops and to any new commercial animal farming, along with the removal of any Tule elk from their native land. The future of Point Reyes National Seashore will be permanently changed without public input. Please take this opportunity right now to comment. May we treasure the land and sea, and always strive to protect these treasures! Next Post Our New Book is Here!